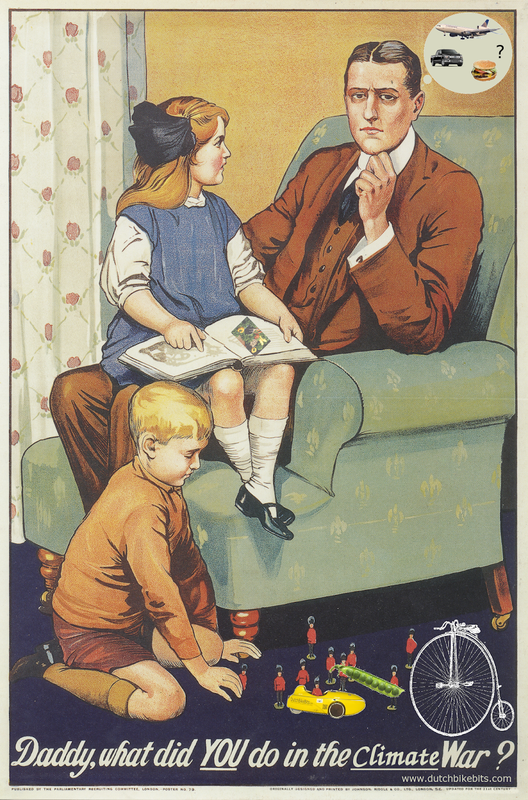 Daddy, what did you do in the climate war ? 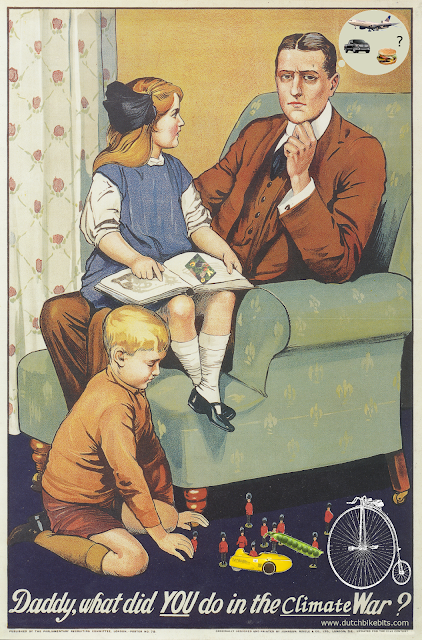 100 years old and subtly updated for the war that we're facing now. Do you remember the 8th of October 2018 ? That was the day when the world's newspapers carried stories about the IPCC's latest report on climate change. We were told that we faced catastrophe if we do not take serious action, starting right now, to tackle climate change within 12 years. We were informed about the most serious issue in the world right now which will affect everyone, or at least everyone's children and grandchildren. Our generation will be held accountable for what we did or did not do. Do you also remember the 9th of October 2018 ? That's the day when nothing out of the ordinary happened. Everyone carried on as usual, doing what they usually did, continuing to cause the problem that they'd been warned about one day before. It's been much the same every day since. Perhaps our grandchildren aren't important after all ? 2018: We're on course for the highest CO2 emissions ever in one year, growing by 2.7% in a year when emissions should be dropping. This is caused by ever increasing use of fossil fuels. Support renewables but the most important thing is to reduce fossil fuel use. Last week we learnt that rather than emissions dropping, as they must, they have actually continued to rise. Why ? Because we're burning more coal, oil and gas than ever and driving more cars than ever. While we like to think of ourselves as "green", we're actually making the problems worse and doing so at an ever increasing rate. Climate change is not being tackled and we have very little time left to reverse the course that we're on. 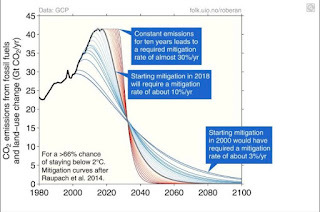 How quickly can we reduce our CO2 emissions? Starting in 2019 we need to reduce our emissions by 18% a year in order to achieve zero emissions in 2050. Each year that we take no action we create a larger problem and time is very short. Source. If we start in 2019 then we need to reduce our emissions by 18% every single year from then onwards. We could have made this easier for ourselves by starting years ago when we already knew there was a problem, but we did not. The generations before us did nothing, my generation has done nothing and those younger than myself also are mostly doing nothing. We have all let our grandchildren down. Humans are making the world on which they live uninhabitable for their own species because we are lazy and greedy. We think we can consume ever more of everything forever, but we cannot. 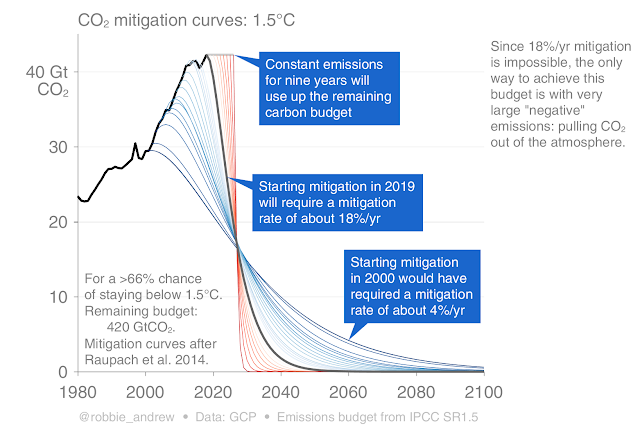 We have already created climate changing effects which have changed the lives on millions of people and these effects will become more serious unless we reduce our emissions to zero by 2050, which is what we need to do to limit the effects to the 1.5 C change which is thought to be tolerable. Who is causing most damage ? 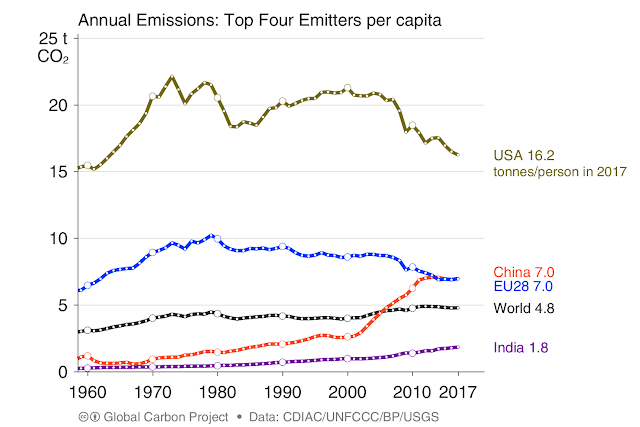 US emissions per capita have been more than double those even of other developed nations for decades. This is not responsible. It is not sustainable. Those of us who live in the developed western countries need to the take the lead because we are the people who have done most to create the problem. We are responsible and we have done almost nothing to resolve the issue. The slight declines in our very high emissions are in large part due to having exported our most filthy industries to countries in Asia. We are still the people with the largest emissions. We are also the people with the luxury to be able to do something about it because it's easier for those who consume to excess to cut back on their consumption. In particular the finger has to pointed in the direction of the USA because that country's citizens have the highest impact on our planet. We should also point our fingers at the top ten percent of the richest people on the planet because if they reduced their emissions to the same level as the average European that action alone would reduce emissions by a third. But we should also note that average citizens of the EU and other developed nations also have impacts which are far from sustainable and China and India have large populatins and are catching up fast. We all need to change what we do in order to reduce our emissions. We cannot expect to carry on with "life as usual", as we did on October the 9th, because with our current actions we are waging war against our own children and grandchildren. None of what is above should be news to anyone reading this. The path that we're on has been obvious for decades. We are on an unsustainable course, sucked into a trap called growth. Many people have taken individual action, but not enough people have done this. I was laughed at for refusing to fly for work in the early 90s. Then, as now, the bicycle was my main form of transport. 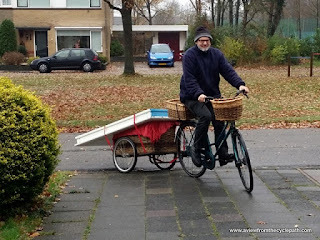 Though we owned a car for many years, we rarely used that or any kind of motorized transport and since we got rid of it three months ago we've made all our journeys by bicycle and foot. We have always tried to make our home energy efficient. We started with insulating our home in the UK more than 20 years ago and since we moved to Assen eleven years ago we have taken at least one step each year to improve the energy efficiency of our home. The walls, floor and roof have been insulated. We've installed HR++ double and triple glazing in our home. We have gas fired central heating but this is controlled by timer so it comes only only for a few minutes before we rise in the morning and then in the evening. Because our home is well insulated and our thermostat is set at 17-18 C, we use far less energy than the average for heating our home. This has also had another happy side-effect for us this week: Energy prices are rising in the Netherlands in part because of taxes designed to encourage more economical use. Dutch news sources report that the average increase in energy bills this year will be quite steep, costing the average household hundreds of euros more per year. We received our estimate this week and it shows no increase at all. We'll remain at the same already much lower than average figure per month because we improved the efficiency of our home. It's a good example of where doing something to save energy also saves money. We installed solar panels on our roof nearly seven years ago which generate hundreds of kWh more electricity than we use each year. This means that the electricity company pays us for electricity. If we count our overproduction of electricity on summer days against our gas consumption on winter days we are not far off being "climate neutral" but "climate neutral" is unfortunately not nearly the same as being independent of fossil fuels: When the sun goes down our electricity comes from the grid, which in the Netherlands is generated 85% by burning fossil fuel and of course our heating system still burns gas directly. This is why it is still very important for us to reduce our consumption of both electricity and gas in any way we can. Rather than forever buying new things to replace old things we try to keep everything as long as we can and repair what we have. We are not "fashionable" so buy clothes when we need them and don't throw them away unless they are completely worn out. When my daughter got married this year I wore the same suit as I got married in 26 years earlier (it still fits). Almost everything can be repaired. Between Judy and myself we repair everything from worn clothes and furniture to electronic items such as hifi components and our inverter and of course that includes our bicycles. We try not to buy anything which isn't necessary. We're not buying presents this Christmas because there is nothing that any of us actually need. In the past it was a bit different when our children were small, but we're all adults now. Of course we do look forward to spending time with our children. That time together is precious but unwanted gifts are not required in order to enjoy time spent together. We don't take holidays. No-one has an entitlement to two weeks in a sunny place during the summer, nor during winter to escape the cold. No-one has an entitlement to "weekend breaks". These are completely unsustainable habits formed in the last few decades. Such holidays are inexpensive in large part because the cost will be paid by future generations. Instead of living in a place from which we needed to escape each year we moved permanently to a place where we wanted to spend the rest of our lives. Perhaps the most important decision which we took, to reduce our load on the planet, for our own health and also for the well-being of animals, was becoming vegan 25 years ago. Since then we've sustained ourselves, our children and our (rescued) dog on a vegan diet, which is significantly less carbon intensive than a diet which includes meat or dairy products. uses better surfaces for bikes these days. 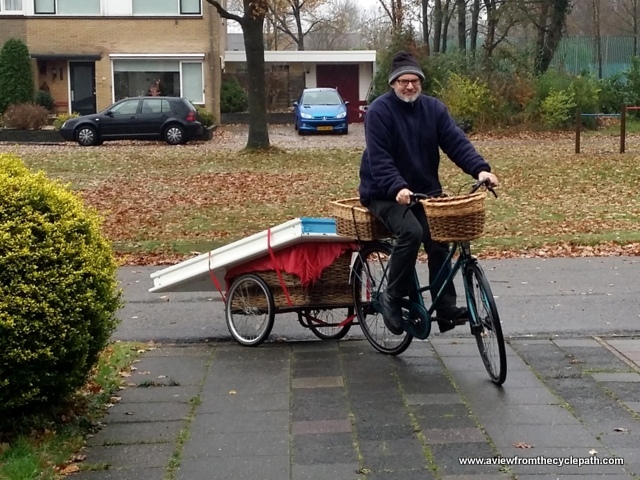 Twenty years ago, when I started campaigning for Dutch style cycling infrastructure to be built in the UK, it was difficult to find information about it and pictures which illustrated how it worked. There were not yet any good online resources to use. I made Video-8 and VHS recordings and also used an early VGA resolution digital still camera to take photos when I visited the Netherlands and returned with them to show people in the UK in an effort to encourage change. Later, we began to encourage people to make the same journey so that they could see how well everything worked for themselves. This was especially so after our first organized formal study tours in 2006, offering a service which no-one else offered anywhere. We thought that if we encouraged people to make the journey to the Netherlands so that they could see this infrastructure for themselves they could return to their home country and campaign for change there. 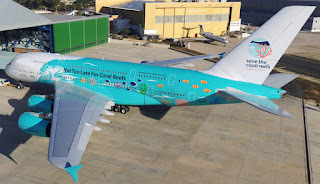 The hope was that this would have an overall positive benefit despite the environmental cost of the journey. I started this blog two years after the first study tour and at that time it was unique. The idea was to keep people who had been on the tour updated with new developments. The blog quickly found a larger readership outside of study tour participants and the blog ended up advertising the study tours to a wider audience. From three years ago we started to try to discourage visitors from visiting from longer distances and last year we stopped actively encouraging people from anywhere at all. The last study tour, booked in 2017, took place early this year. After that we stopped encouraging more bookings. There is no environmentally responsible way of continuing to do this. Making international journeys is not compatible with preserving our climate. There is no longer a need to come to the Netherlands to find out about what makes cycling attractive, convenient and safe in the Netherlands. The situation now is very different to how it was when we started doing this twenty years ago. I now encourage people not to make the journey. Please do not travel to the Netherlands to see us, nor to see anyone else. Please do not go anywhere else either. It's simply not necessary to do this any more. Flying or taking a ferry merely to cycle far fewer kilometres than motorized vehicles will transport you, even if you're making that journey to find out about cycling infrastructure, is amongst the most unsustainable thing that any of us can do. It's also completely unnecessary because these days you can see everything you need to see on a mobile phone or computer screen at home. There is more information about cycling infrastructure online now than anyone could possibly read. There are more videos of cycling infrastructure than anyone could possibly watch. 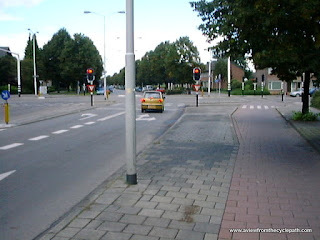 This blog includes many good examples of cycling infrastructure. So does my youtube channel. There are also many other blogs and youtube channels which sprung up after this blog, several of which are far more popular than I am. You can make use of all of this information from multiple sources, from people with differing opinions, all of it free of charge, and you can make use of it while consuming less of your time and money and with a considerably smaller carbon footprint than would be the case for making a journey to the Netherlands to see it first hand. even switching to a much more efficient mode of transport. We have to make fewer and shorter journeys to fix this. The unbelievable rate of growth of aviation is one of the leading reasons why the CO2 emissions caused by human beings continue to grow rather than shrink. On average, every person on the planet now flies 1000 km a year even though a minority of the world's population ever fly at all. Taking a ferry instead doesn't give a free pass either as that pollutes even more. While a train may consume a little less it is also unsustainable because they are either powered by diesel or by electricity from the same grid as everything else. i.e. in the Netherlands the trains are 85% powered by fossil fuels. In the UK it's typically around 60% except on the windiest of days. What's more, when a full analysis is made of the cost of infrastructure as well as fuel, the environmental cost of the far more extensive infrastructure required for trains closes the emissions gap with aviation. All motorized modes pollute to a similar extent per passenger km. "save the coral reefs" design. This won't save anything. There are of course many claims made by those who do marketing for travel companies. For example, the Dutch railway company claims to run trains on "100% green electricity" even though in reality they can't possibly do this. On still nights when there is no solar or significant wind energy those trains still run on the same time-table. Like many organisations which claim to be green they are using an accounting trick to pretend that buying credits for green electricity is the same as consuming green electricity. The train company also doesn't bother mentioning the huge environmental cost of their extensive infrastructure (see graphic below). Similarly, shipping companies get press for similar claims and so do aircraft manufacturers and airline companies. It's all greenwash. The problem is motorized vehicles in general, not one mode in particular. Different powered modes compared. Peak time buses look relatively efficient, but that's only because off peak buses considered separately. Rail and air travel have comparable total energy consumption and greenhouse gas emissions to an average car. 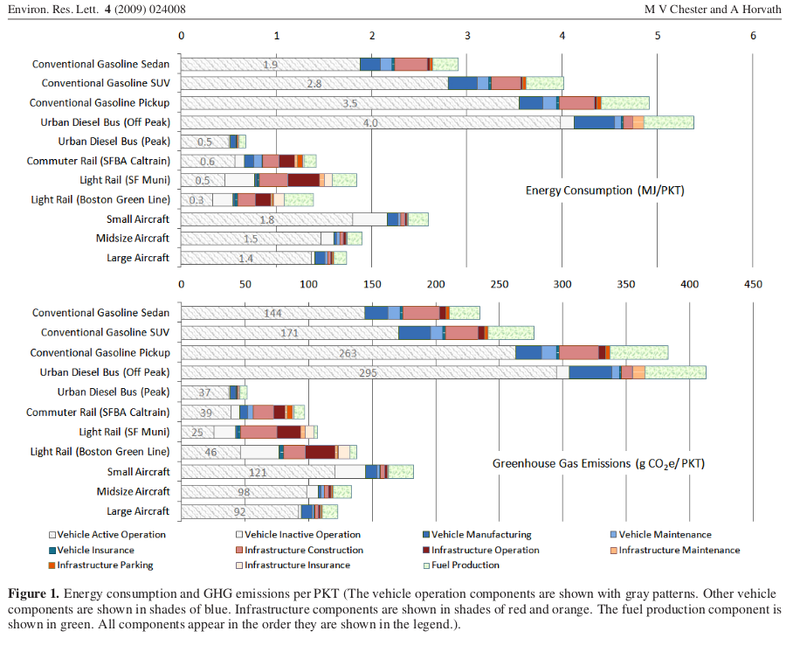 Switching from one powered mode to another does little to reduce emissions. Emissions can be reduced only by reducing use of powered modes. source. Because of their numbers, motor vehicles now create far greater problems across the world than they used to. It's no longer just a problem confined to a few big cities, but something that has spread across countries and continents to endanger the entire planet. The two most significant things that we can do to reduce our footprint on the planet are to sharply reduce both our use of motorized transport and our consumption of meat and dairy products. Given the state we're in, with climate change now discussed alongside nuclear weapons as a threat to us all, is it not time for us all to do both of these things ? Cycling should rightly be part of the solution to climate change. Unfortunately, the way in which many people use bicycles makes them anything but a solution. If we fly to cycle, or drive to cycle or take the train to cycle then we reduce cycling to an accessory to those same motor vehicles as are responsible for a good part of climate change. A little bit of cycling at the end of a long journey by motor vehicle does not undo the harm done by the motor vehicle. Let's stop the habit of flying, driving and taking the train to cycle and ride our bicycles from our homes to our destinations. The impressively huge cycle parking facilities at Dutch railway stations are not a sign of a truly sustainable transport system. Railway station cycle parks and full trains are evidence that thousands of people make regular journeys in an unsustainable manner (Dutch trains, like everything else connected to the grid, run almost entirely on fossil fuels) and those bicycles that you see at the stations have been reduced to being enablers of journeys by motor vehicle. If the owners of those bikes could make their entire journey by bicycle then they wouldn't park their bikes at railway stations. Large railway station cycle parking facilities look impressive but they are evidence of an addiction to motorized transport. Good planning would reduce the majority of journeys to cycling distance. If we're not planning in such a manner which does this then we will fail to reduce the use of motorized transport. Note that even in the Netherlands, 90% of the distance which the population covers every year is in a motorized vehicle. That's about as good as it gets anywhere in the developed world right now but making only 10% of our journeys by distance by human power simply isn't enough for us to meet our climate goals. Wake up, bloggers and campaigners. What is a cyclist? There are many popular blogs and youtube channels written by people who fly far more kilometres each year than they cycle. Why is this seen as aspirational ? Those who fly more than they cycle should be recognized as aviation enthusiasts, not cyclists. People who drive more than they cycle as drivers, not cyclists. People who take the train more as train enthusiasts, not cyclists. This blog has from the beginning been about cycling. If we are to claim that we cycle then let us adapt our lifestyles so that we can make entire journeys by bicycle rather than making small parts of our journeys by bicycle. It is only by thinking about how to remodel societies to encourage journeys of cycling distance that we will truly wean ourselves away from motorized transport and therefore away from the modes of transport with which every kilometre that we travel brings us slightly closed to making conditions on our planet incompatible with the human race continuing to exist. What did you do in the climate war ? We face the possibility of making our planet into a place where our grandchildren can no longer live. How will we be judged by future generations? Personal action is not the only action worth taking but it is certainly a contribution. Our society is made up of individuals. If we, en-masse, call for change then change might occur. If we wait for someone else, somewhere else to change things while we continue with the same behaviour then we are dooming future generations. How do you want to be judged ? Notes Far too much emphasis is being placed currently on the idea that electrification will solve our problems and that the electricity will come from renewable resources. The numbers don't add up for this. One example: there is not enough space in the Netherlands to erect a sufficient number of wind turbines to provide enough electricity even to cover our existing use, let alone the greatly increased amount of electricity that we would need should electric cars become mainstream. This is the case even without taking into account the lack of storage mechanisms required which make it impractical anyway. Every electric car sold adds to consumption and makes it more difficult for the Netherlands to shut down its fossil fueled power stations. The EU's current target for 2030 is an eight percent increase in CO2 emissions due to transport relative to 1990. This is not an example of heading in the right direction. Only a reduction in use of motorized transport can lead to a reduction in emissions. Enough of cars... Overuse of motorized transport is destroying everything. Le Curé: "I don't like cars". Three months ago our car reached the end of its economical life and we took it to be scrapped. I'm not missing it. I never used it much anyway. When we first moved to the Netherlands we brought our car with us from the UK but after we arrived it didn't move a single centimetre until more than three years had passed and we finally got around to registering and insuring it. Even longer ago, when I eventually learnt to drive I was 27 and I only did so then because it was forced by circumstances. Cars never appealed to me. I had a car for somewhat under less than half of my life, didn't use it much, and becoming car-free again isn't so much a change as it is a return to normal. The effects of Brexit have cost us twice as much as the price of some new cars, but if such a windfall arrived I wouldn't rush out to buy a replacement. Giving up a car isn't difficult if you didn't use it much anyway. Neither Judy nor myself have ever been particularly enthusiastic or high mileage drivers. We've always chosen to live close to places that we needed to go to regularly such as work and shops and by ensuring that our regular journeys were within walking and cycling distance we freed ourselves from having to drive everywhere. Our car was built in 1998 but we bought it in 2007 with 84870 km on the odometer. On its final day the odometer showed that it had covered a total of 115300 km in 20 years and 3 months since its first registration. Over 11 years and 8 months we had driven 30430 km. That's an average of 2600 km (1630 miles) per year for Judy and I combined. In fact we drove slightly less than that because neither of our adult children own their own cars and they sometimes used it too. a car it's no more difficult to transport things like this by bike. Large objects don't fit well into the back of an average car. When we used our car it was usually as a small van or bus for an exceptional journey which we couldn't make by bike. It was never used for everyday journeys such as shopping, commuting, taking children to school or for our business. The many bicycle components which we send to customers worldwide always begin their journey by bike. Though there are always other ways to do things, once we had it it didn't cost all that much to keep and it had the advantage over a rental that we could put messy things in the back without losing a deposit. Sometimes it was genuinely useful and convenient: It transported us from our old home in the UK to our new home in Assen, our adult children moved between rooms in shared houses before they found flats to live in long term, and a couple of times it covered half its annual distance in just one week when we went together on holiday to visit family in the UK. But even including some of these longer journeys our total distance never added up to very much. 2600 km a year works out as something around 30 hours of driving per year. It's only possible to run up high mileage in a car if you sit in it for a lot more time than that, you have constructed your life around using it, and you drive more or less every day. We have always cycled much more than we drove. A subsidy for zero emissions ? Our car probably had the lowest emissions of any in the city. Our emissions were low because we filled the petrol tank infrequently. Now that we've replaced it with no car at all, our emissions from personal transport have dropped from much lower than average all the way down to zero. 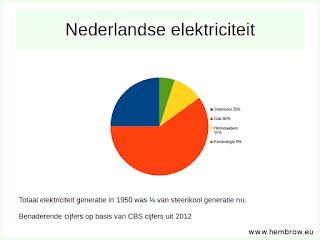 85% of Dutch electricity comes from fossil fuel sources. 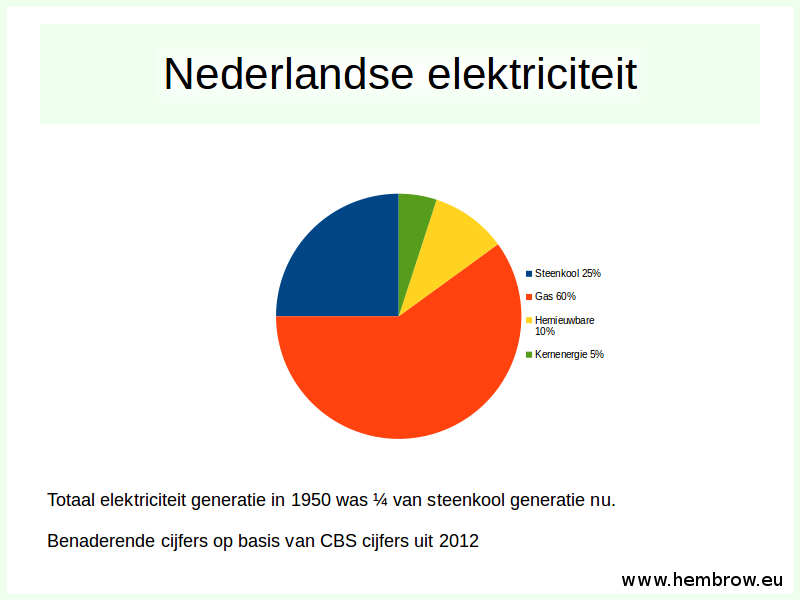 was 65% fossil,14% nuclear,2% wind,2% from NL. The Dutch government subsidizes purchases of new electric cars to the value of €6000 and offers other tax advantages. Similar subsidies are available all around the world for scrapping old cars and buying new ones. 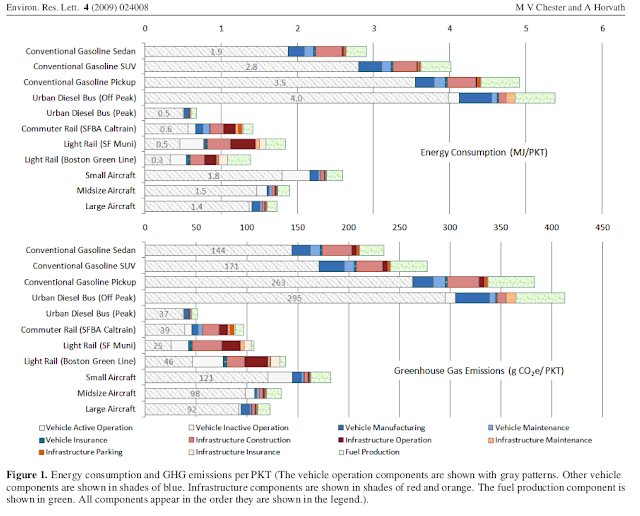 The best that any alternative fuel car can do is pollute fractionally less than the one it replaced. This attracts a generous subsidy even though a background of rising use means that the energy consumption and resulting pollution will continue to rise even with slightly more efficient cars. These subsidies are only ever available to people who buy another car and who commit to continuing to pollute by continuing to drive. No subsidies are available to those who stop driving and stop polluting or for those who never started. Having received €50 scrap value for our car and having stopped driving we will continue to pay tax as usual, some part of which will be used to subsidize people who continue to drive and continue to pollute. Update January 2019: An editorial in our local newspaper confirms my suspicion. The €6000 subsidy is going in large part to people who buy large electric cars which create higher emissions than small petrol cars. It's not advantageous for the environment to subsidy purchases of electric cars, it's only advantageous to the wealthy. over 11 years in the car. Cycling and walking are the only truely zero emission means of transport. Cycling is more effective because a bicycle amplifies the effort of a human so that we can go much faster, over longer distances and comfortably carry weight well in excess of that we can carry when walking. This makes cycling a great choice for everyday transport. A person on a bike can travel 5000 km per year using no more energy than that which we have to consume just to achieve the recommended daily amount of exercise. No external source of energy is required. No charging of a battery or filling up of a petrol tank. 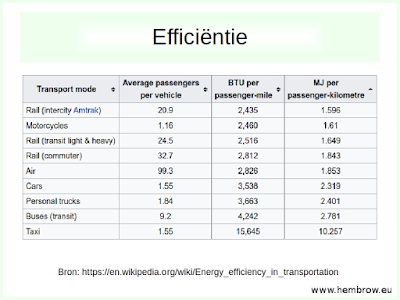 The most efficient vehicles on the planet are Dutch, they're human powered and therefore have zero emissions, but they receive no subsidy from the Dutch government which is sadly more enthusiastic about subsidizing imported electric vehicles which can never be emission free because 80% of Dutch electricity comes from burning fossil fuels. the 1950s. A template copied around the world. Driving should not be viewed as socially normal. Motorized transport is one of the main factors which is destroying the conditions on this planet which we require in order to live. 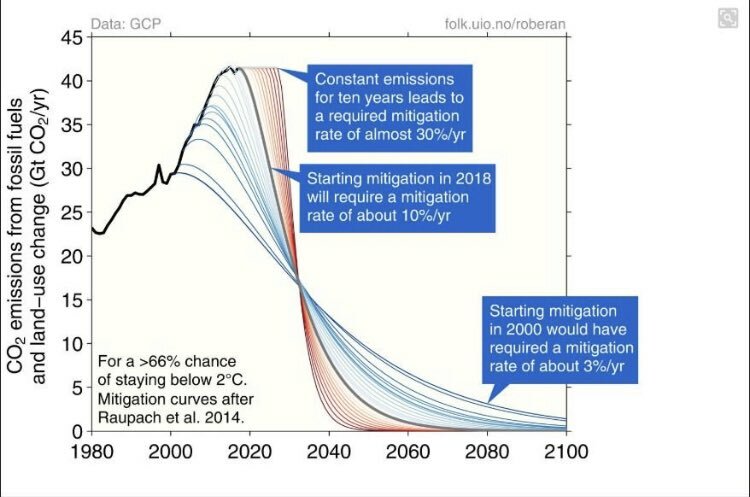 By rapidly consuming resources which can't be replaced we're also reducing the options available for our children and grandchildren who will have a hard time living on the planet which we have left for them. There is no other place for us to live other than on this planet but we are risking making our only home into a place where human life will be difficult at best. Genuinely excellent new cycling infrastructure in Assen. makes it much easier to use cycles as everyday transport. The risk of making human life impossible seems to me to be rather a high price to pay for something which it seems almost no-one actualy even enjoys doing. Driving is so boring that people regularly fall asleep behind the wheel. When it isn't inducing sleep, driving a car means paying for fuel, for maintenance, for tax, for insurance and for parking. Driving also means stressful queues in traffic jams, searching for parking spaces in cities, road rage, insurance claims after crashes and also the sorrow caused by more than a million deaths in car crashes every year. Even drivers who never crash their cars still cause deaths: The death rate from air pollution due to cars (car exhaust and particulate pollution which largely comes from tyres) is four times so high as that from crashes. was retrofitted here, pedestrians couldn't safely cross the road. Where is the social good in any of this ? We would all be better off if we lived such that we didn't need cars. We'd all be better off if we stopped designing the places where live as if cars were the most important things in them. We got into this state because problems which were seen very early on in the history of motoring were ignored. The first car crash fatality resulted in a judge saying that "this must never happen again" but others did not heed his call. Rather than taking action when problems such as pollution and congestion were first observed, cities around the world instead repeated the same mistakes of treating this threat as an inevitability and trying to adapt themselves to cope. 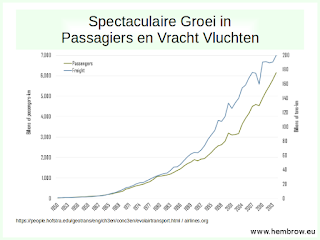 The Netherlands provides some excellent examples of where policy has been turned around, but prioritization of motorized vehicles can still be seen here too. To this day, the Dutch government spends vastly more on infrastructure for cars than on infrastructure for cycling. Cyclists are sometimes put into dangerous situations for the convenience of motorists. Even the world's leading cycling city pushes bikes into undesirable conflict. A few months ago I watched a TV interview in which a representative of an aircraft company stated that every human on the planet now averages 1000 km of flying per year and they're expecting this to continue to grow. 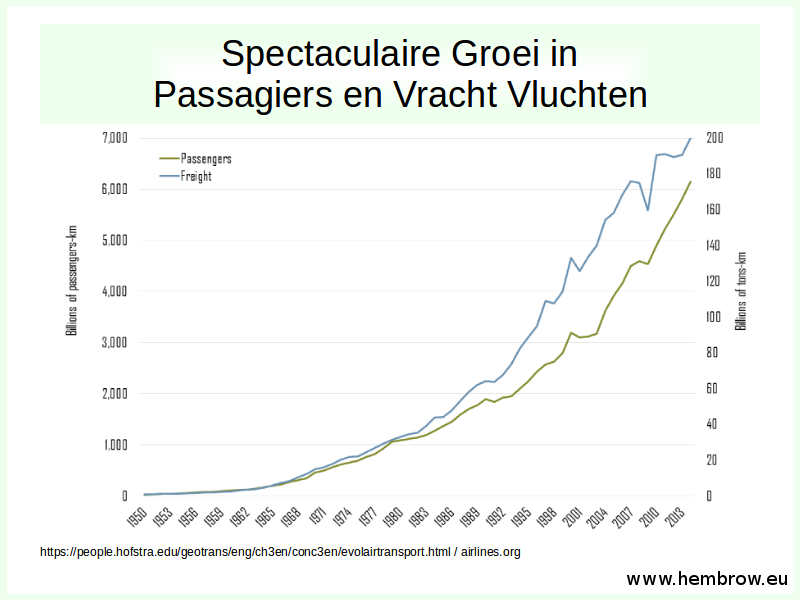 What used to be a small cause of pollution because few people did it has now grown into something ar more significant due to exponential growth of flying since the 1950s. While modern aircraft are vastly more efficient than older models and also far more efficient than ships, no efficiency improvement is meaningful when seen against this rate of growth. We all make our own excuses, but we've all got to stop relying on powered transport. Cars and aircraft are not the only problems. If we make the same journeys using different modes of powered transport then the problems remain. An individual's impact per km may be slightly lower by switching to train or bus but it remains an impact and we need to cut our emissions to zero, not just by a few percentage points. fewer and shorter journeys is far more important than changing modes. Every form of powered transport pollutes. 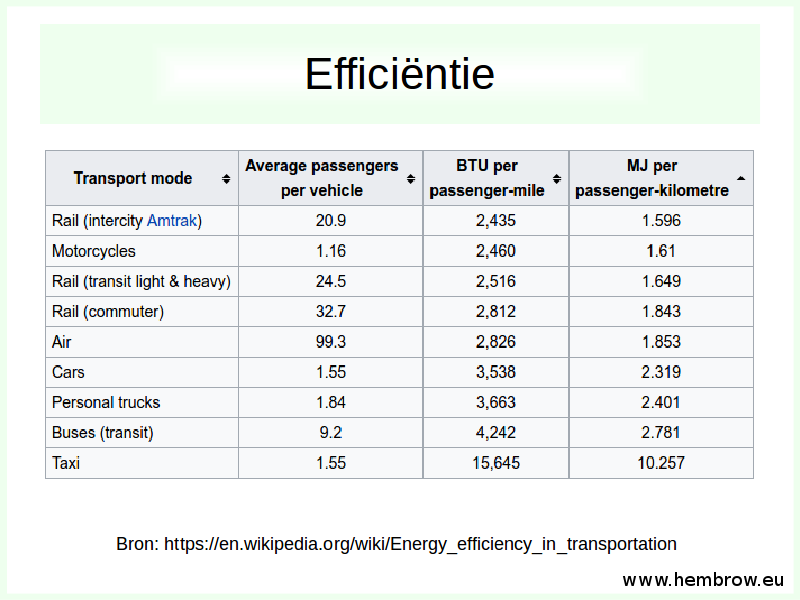 Travel so much as you want by foot or by bicycle every year and you do not trash the planet by doing so, but if you fly, drive or even take the train all of those modes consume about the same amount of energy per passenger km and all are problematic. Changing between modes against a background of ever increasing transport is at this stage akin to moving deckchairs on the Titanic. It hardly makes hardly any difference at all which powered mode is used. We need to travel much less in order to leave behind a planet on which our children and grandchildren can live. Every single km has a cost. Everything starts with individual action. Yes we need to lobby government and try to change the action of large companies but in large part we're the customers of that government and those companies. If we provide the demand they provide the product. If we reduce our dependency on externally powered devices which use engines and motors to push us around and start to use our own muscles then we have made a change to the market served by those actors. If considering a journey over a distance which can't be covered by human power alone, how do we justify that we should do this at the expense of all those who will come after us ? Is there genuinely a greater good which will come from that journey ? Do such journeys need to be made at all ? Addendum: If I always felt like this about cars why on earth did I ever learn to drive ? Getting a driving license is widely seen as some kind of right of passage. "Cartwheels turn to car wheels," a metaphor for a child becoming an adult. Not everyone sees it that way of course and even as a child I did not. I saw cars as yesterday's technology, smelly and inefficient and I held out from bothering to learn to drive for as long as I could. This turned out to be until I was 27: Judy was pregnant and a car was the only sensible way of reliably being able to travel at any time day or night from the village in Cambridgeshire where we lived to the closest hospital to our home. It was only 15 km between our home and the hospital, so not an extreme distance. Shortly afterwards my regular cycle commute grew to 20 km each way. But the hospital trip was not a journey that either Judy or myself thought she'd want to make by bicycle so I quickly learnt to drive so that we could be sure about what we'd do on the day. When I drove to hospital I immediately found myself on the wrong side of the parking policy which attempted to deter driving by charging a lot for parking and allowing payment only for short periods by advance tickets from a machine in the car park. This policy existed in almost total absence of infrastructure which made cycling into a safe and pleasant experience for everyone and therefore was completely ineffective: the car park was more or less permanently filled. Because of this policy, brought in in with total disregard for the surrounding chaos on the roads, the arrival of our daughter was interrupted by having to repeatedly leave my wife to "feed the meter". As soon as they could sit in the seats of this tricycle, this is how we transported our now adult children for all our short journeys. If a good alternative to driving had existed then we'd have used it. I was forced to learn to drive because Cambridge and Cambridgeshire were (and still are) built around cars as the main means of transport. I'm not an advocate of driving but I remain against the idea of charging patients at hospitals for car parking as any part of an attempt to change behaviour. No-one visits hospitals for fun. There's always stress and it's quite possibly some kind of family emergency. The other 364 days of the year are a better time to educate people about transport and that is best done by providing world class infrastructure which encourages people to cycle instead of drive for their regular journeys. In an emergency people will naturally turn to whichever form of transport they have become used to and what they will be used to is whatever works best on the infrastructure provided in the area. Note that here in Assen where extremely good cycling infrastructure enables cycling for a far wider range of journeys, the hospital provides good access by bike and many visitors use it but there is also free parking at the hospital for those who arrive by car. While many people make a high proportion of their everyday journeys by bike, few Dutch women in labour travel by bike to give birth.